Retro Reels: Diamond Glitz Video Slot Review - Casino Answers! Retro Reels: Diamond Glitz is a 5-reel, 25-line video slot developed by Microgaming, featuring scatter wins, multipliers, a free spins feature and a re-spin feature. You can play the Retro Reels: Diamond Glitz video slot at Bovada. The coin values that are available on the Retro Reels: Diamond Glitz slot machine include $0.01, $0.02, $0.05, $0.10, $0.20 and $0.25. You can select 1-25 paylines at 1-10 coins per spin. The lowest total bet you can make on Retro Reels: Diamond Glitz is a penny per spin up to the maximum total bet of $125 per spin. Retro Reels: Diamond Glitz has a good betting range and is ideal for casual slots players as well as high rollers. There is a skill stop feature available, so that players can manually stop the reels at will. To play the Retro Reels: Diamond Glitz slot game, select your bet and hit the “Spin” button or use the “Bet Max” button to play with all 25 paylines at 10 coins per line. The highest paying symbol on the Retro Reels: Diamond Glitz online slot is the Dollar Sign symbol. 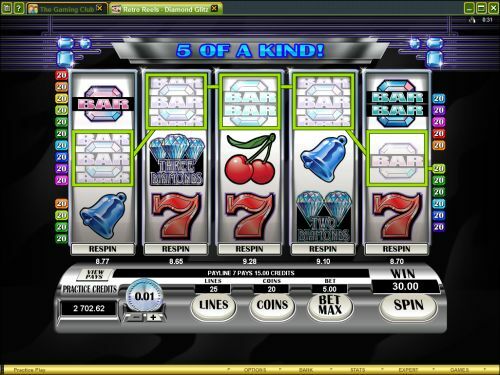 If you are able to line up 5 Dollar Sign symbols on Retro Reels: Diamond Glitz, you will win the 10,000 coin top jackpot. The 5 Free Spins Bonus symbol is the scatter symbol on Retro Reels: Diamond Glitz. You can get a scatter win by hitting just two of these symbols anywhere on the reels. You can win up to 100X your total bet by having 5 of these symbols appear anywhere on the reels of the Diamond Glitz video slot. If you land 3, 4 or 5 scatter symbols, you will win 15, 20 or 25 free spins at a 2X multiplier. All wins during the free spins feature are doubled. The free spins feature can be re-triggered. All bets and lines played are the same as the triggering spin. Winning symbols must appear on paylines in play and on adjacent reels, beginning with the far left reel. All wins are shown in credits, and only the highest winning combination on a payline will be paid. Only one win per payline. You can win up to 440,000 coins during the free spins feature when you play at Bovada! A new feature on the Retro Reels: Diamond Glitz video slot is the re-spin feature. After every spin you make on Retro Reels: Diamond Glitz, a price will appear at the bottom of the reels. Above the price is a “Respin” button, which you can press to re-spin that reel independently. The price of the re-spin is dependent on how valuable that re-spin is. If you have 4 of a Kind, the re-spin cost on the fifth reel is going to be much higher than any of the other reels. Only wins that involve the re-spun reel will be paid out. The re-spin feature is not available during the free spins feature or when changing the size of the bet. Hit the “Expert” button to gain access to the Retro Reels: Diamond Glitz autoplay mode. You can play 5 or 10 quick autoplay spins or you can use the “Auto Play” button to expand to advanced settings. You can play 1, 5, 10, 15, 25, 100, 250 or 500 autoplay spins and you can set autoplay to stop if a win exceeds or equals $1, $100, $500, $1000, $5000 or $10,000. Autoplay will stop if you trigger any feature contained in the game. You can stop autoplay at any time. 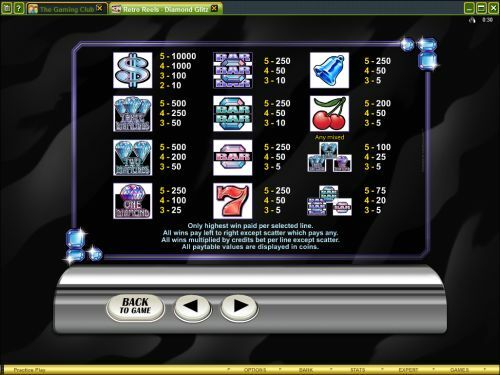 Retro Reels: Diamond Glitz is a fitting twist on the original Retro Reels video slot game. It’s got all the greatness of the original version of the Retro Reels slot game but with even more glitz and glamour! You can play the Retro Reels: Diamond Glitz video slot when you sign up and make a deposit today at any Microgaming online casino, including Bovada! Can players from the USA play the Diamond Glitz video slot for real money? Unfortunately, USA-based players cannot play the Retro Reels – Diamond Glitz online slot game for real money. For a great selection of video slots you can play if you are based in the United States, please read our Bodog Online Casino Review. Where can I play a free Flash game of the Retro Reels: Diamond Glitz slot machine? You can find the Diamond Glitz flash game at Bovada. If you experience any issues with the Instant Play casino, make sure you are using the latest version of Adobe Flash Player. What is the re-spin feature on the Retro Reels video slots? The re-spin feature that is found on the Retro Reels, Reel Gems and other new Microgaming video slots gives the player more power over the slot machine. Did you come one symbol away from a jackpot? Re-spin the reel in question and maybe you will hit your 5 of a Kind jackpot on the slot machine! You can try these new, innovative video slots out at Bovada.